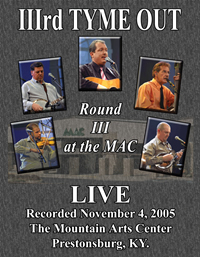 Released in 2007 and 93 minutes in length, this DVD performance was captured at the Mountain Arts Center in Prestonsburg, KY. This DVD has 16 song performances, backstage footage and interviews by members of IIIrd Tyme Out for a more in-depth look at the band! Written by Keith Caudill, executive director of the MAC, “The Mountain Arts Center is again honored to be associated with IIIrd Tyme Out, one of the premier groups in bluegrass music. We hope you enjoy reliving their latest dynamic performance from the MAC stage, and we know that you, like our patrons, will be literally dancing in the aisles.